Armed antigovernment extremists, including the sons of Nevada rancher Cliven Bundy, seized an unoccupied federal visitor’s center in Oregon over the weekend after their rally failed to convince two ranchers to continue defying the U.S. government. Dwight Hammond, 73, and his son, Steven Hammond, 46, both convicted of arson for starting fires on public lands adjoining their ranch near Burns, Ore., said they would report to federal prisons in California today and begin serving 5-year mandatory sentences and not seek sanctuary from the local sheriff and militia and Patriots. Extremists and antigovernment activists from throughout the country, particularly the West, flocked to Burns for the Saturday rally supporting the Hammonds, who didn’t participate. After learning the Hammonds didn’t want to be the new poster boys for the latest antigovernment theater and, instead, would be surrendering to the federal Bureau of Prisons, some of the demonstrators, including Ammon and Ryan Bundy decided without prior public announcement to occupy the Malheur National Wildlife Refuge headquarters. They reportedly found a ring of keys to gain entry to the federal facility 30 miles southeast of Burns that wasn’t staffed over the New Year’s holiday, various media outlets reported. The startling development in Oregon seems to be further evidence that because there were no arrests following 2014 Nevada “Bunkerville” standoff, the Bundys and some of their militia supporters feel emboldened, and ready to take the next step toward possible violence. One of Bundy’s sons involved in the new standoff at the Malheur National Wildlife Refuge, Ryan Bundy, told the Oregonian that he and other armed Patriots are “willing to kill and be killed if necessary.” Another militia activist involved in the standoff, Jon Ritzheimer, made a farewell video that was posted last night on YouTube. 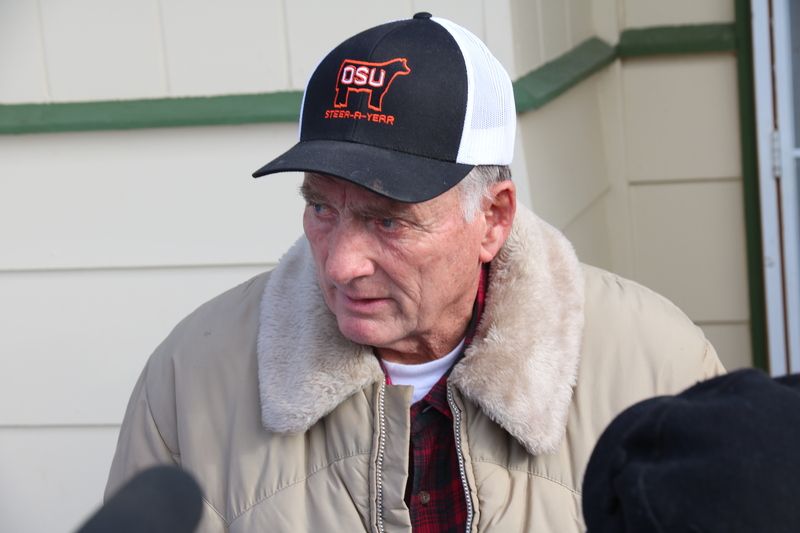 Another son, Ammon Bundy, told the newspaper that he and others occupying the U.S. Fish & Wildlife headquarters were “planning on staying here for years, absolutely. This is not a decision we've made at the last minute.” Media outlets reported those involved in the take-over appeared well-supplied and armed. The Oregon standoff follows similar dust-ups last year in Oregon and Montana between the U.S. Forest Service and the Bureau of Land Management and assorted antigovernment extremists, including members of the Oathkeepers and individuals calling themselves the “III Percenters” in memory of the minority of U.S. citizens who fought in the American Revolution. As the Burns takeover enters its third day, law enforcement officials had taken no action. Authorities likely will set up a perimeter, preventing others from joining the takeover or participants from leaving, and they could cut off electricity and water to the facility. But the takeover could last for days, even weeks.Public school classes in Burns were cancelled for the week as local law enforcement urged area residents to stay away from the take-over site and "maintain a peaceful and united front and allow us to work through this situation." The Oregon State Police issued a statement late Sunday indicating that a joint county-state-federal command post would be operational today, but didn’t provide other details, including its location. The lawman at the center of the action at the moment is Harney County Sheriff David M. Ward, who has less than a half dozen deputies to police the ninth largest county in the United States. The sheriff reportedly received death threats for not being a “constitutional sheriff,” standing up what the antigovernment extremists brand as the “tyranny of the U.S. Government,” and offering sanctuary to the Hammonds – something they didn’t request. An attorney representing the Hammonds said the Bundys and the assorted militia leaders do not speak for his clients. They were sentenced to 5-year prison terms in October after a federal appeals court ruled that much lesser sentences they received in 2012 didn’t comply with federal law backing congressional intent. 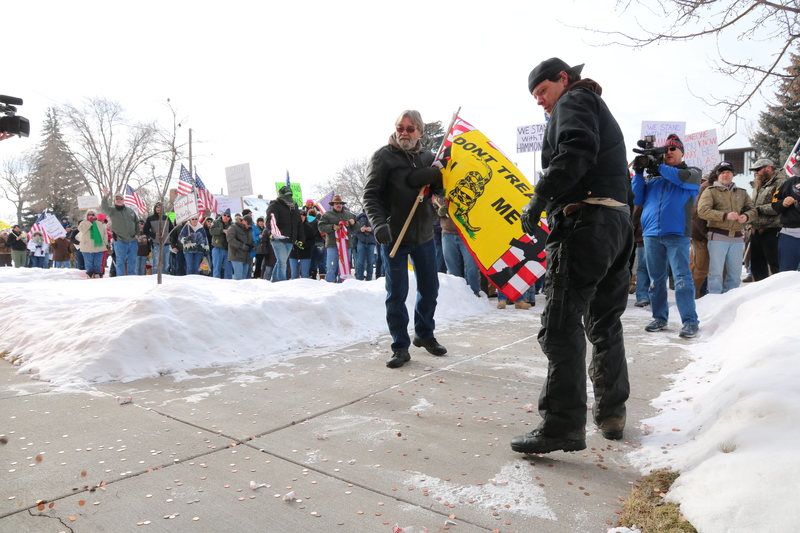 Saturday’s rally in Burns began before noon when an estimated 250 anti-government Patriots, III Percenters and assorted armed militia members gathered in single-digit weather in a Safeway parking lot in downtown Burns. There were no sheriff’s deputies or Oregon State Police officers or vehicles visible. The five-year prison sentences given the Hammonds – in line with a minimum, mandatory term set in law by Congress – and the fight over use over local control of federal public lands ostensibly were the reason for the rally, but many clearly came with their own agendas. There were signs and vehicle stickers protesting federal control of vast portions of land in the West, while others bashed President Obama, liberals, predicted government plans to microchip its citizens and endorsements for the “Police Lives Matter” movement. An official with the Constitutional Sheriffs and Peace Officers Association (CSPOA) said its founder, former Arizona sheriff Richard Mack, was in the crowd, as was extremist radio host Pete Santilli. Townsfolk who watched the rally said they didn’t see any Burns residents, including members of the extended Hammond family, participating in the rally. Kainan Jordan, another Burns resident, said he was puzzled why outsiders would attempt to hijack the Hammond cases for their own agenda. “It’s the mindset that kind of mystifies me,” he said. Jordan said he knows the Hammonds and described them as “God-fearing people who like to keep to themselves,” and likely don’t appreciate the attention from militia and antigovernment extremists from other parts of the state and country. While she wasn’t embracing the militia extremists, Rhines said she has been a cattle rancher and worked in the county most of her life, and understands the frustration ranchers have in dealing with federal agencies, including the Bureau of Land Management and the U.S. Fish and Wildlife Service. McCanna said her family didn’t want her to participate in the counter-protest because some families, including those related to law enforcement officials, have been targets of intimidation by militia and III Percenters. “They’ve parked outside people’s houses, kind of doing the intimidation thing,” she said. “I do think this government isn’t handling the [Hammond] case right, but the way to fight it is in the courts,” McCanna said. “I’m protesting their methods,” she said of the gun-toting militia demonstrators across the street. With their assorted flags, including the “Don’t Tread on Me” Gadsden flags unfurled, the demonstrators sang “God Bless America,” before marching to the Harney County Sheriff’s Office. There, at the locked front door of the pink building, Ammon Bundy handed out rolls of pennies to the demonstrators who took turns throwing the coins on the sidewalk, supposedly a symbolic gesture that Sheriff Ward was a “sell out to the feds” because he wouldn’t intervene and offer a local sheriff’s sanctuary to the Hammonds and accept militia support. The sheriff previously told Oregon Public Broadcasting that he received “death threats” after telling militia organizers he wouldn’t create a “safe haven for the Hammonds” to stay in Harney County and not comply with the federal judge’s order to report to prison. “I haven’t slept a full night in close to two months now. I have a lot of anxiety,” he told a reporter for public broadcasting. “What we’ve been threatened with here is civil unrest and the insinuations of armed rebellion,” he said. From the sheriff’s office, the demonstrators on Saturday continued up the street to the home of Dwight and Susan Hammond. They have turned over Hammond Ranches, their 12,000-acre cattle operation south of Bend, to their sons. Their property includes an airstrip and a private fishing lake. To the surprise and cheers of the demonstrators, the Hammonds appeared on their front porch after David Duquette, of the “Protect the Harvest” organization knocked on their door. “This is not about me. It’s about America,” Dwight Hammond shouted to the demonstrators stuck bouquets of flowers and roses – purchased at bargain prices at the Safeway – in snow banks covering the Hammonds’ front yard. After personally greeting and shaking hands with many of the demonstrators, Dwight Hammond held an impromptu press conference on his front porch, answering reporters’ questions – something he’s previously refused to do. At his resentencing hearing in October, Hammond didn’t exercise his right to address the court. “I guess I’ve been so dumbfounded about this whole thing, that I’m just speechless most of the time,” he told reporters Saturday. “At the start of our trial, the federal prosecutors said, ‘We’re going to make examples of these two men,’ and a lot of people heard that,” Hammond said. His son, Steven, wasn’t present to greet the demonstrators, but a family attorney said he, too, will surrender Monday to a federal prison in California. Initially after being convicted of committing arson on federal land, Hammond served 90 days in jail and his son was sentenced to a year and a day. But with those sentences ruled illegal by a federal appeals court, they both will now have to do the remaining four years and a few months. With credit for good time, the elder Hammond will be nearly 79 when he gets out of prison. Hammond said federal authorities waited 11 years to bring charges against him and his son “and when they did they charged us as ‘terrorists.’ The vendetta that went into this is unbelievable,” he said. “I’m going to jail for burning 127 acres,” he said. “It seems like a bit of overkill. But with heavy heart, I will turn myself in.” Federal court documents say the acreage was 139 acres. If they failed to voluntarily surrender, federal prosecutors would ask the sentencing judge for a bench warrant and deputy U.S. marshals would arrest the Hammonds as fugitives. “I’ve always tried to stay within the law,” Dwight Hammond said in explaining his decision to surrender. Hammond made it clear he wouldn’t bow to the militia groups’ request and seek sanctuary from them or the local sheriff. Rather, he said, he planned to travel by car to Boise, Idaho, and catch a flight to Los Angeles where he previously was scheduled to surrender today to the U.S. Bureau of Prisons. The Hammonds’ have a lengthy history of encounters with federal agencies and their officials, including special agents who enforce federal laws enacted by Congress. In 1994, Dwight Hammond and his son Steven were arrested by federal agents after a long-simmering dispute over cattle grazing on public land, fences and water use on the Malheur Wildlife Refuge –– the same reserve where the militia occupation is now occurring. The Hammonds were arrested and federally charged for obstructing and threatening federal workers building a fence to keep the Hammonds cattle from trespassing on the public refuge, which is a sanctuary for migratory birds. The Hammonds got support from 500 “incensed ranchers” and the American Land Rights Association, part of the anti-federal land “wise use” movement that has helped spread the so-called “Sagebrush Rebellion” across the West. The Oregon Lands Coalition also weighed in on behalf of the Hammonds, describing their 1994 case as “a hostage situation,” High Country News reported. Federal prosecutors later reduced felony charges against the Hammonds to misdemeanors. But the fighting between the Oregon ranchers and the federal land agencies didn’t end there. In 1999, federal land managers contacted Steven Hammond and warned him that he couldn’t burn public lands without prior approval from the BLM. “But in September 2001, the Hammonds again set fire on their property that spread to nearby public land,” the 9th U.S. Circuit Court Appeals said in reviewing the case. “Although the Hammonds claimed that the fire was designed to burn off invasive species on their property, a teenage relative of theirs testified that Steven had instructed him to drop lit matches on the ground so as to ‘light up the whole country on fire,’” the appeal court held. The teenager followed the direction of the elder Hammond “and the resulting flames, 8-to-10 feet high, spread quickly,” briefly endangering the youth’s life. The fire started by the Hammonds burned 139 acres of public land and took the acreage out of production for two growing seasons, the appeals court said. In August 2006, when lightning started several fires near where the Hammonds grew their winter feed, Steven Hammond attempted a back-burn near the boundary of his land. That fire burned about an acre of public land. A 2010 grand jury indictment said “Hammond family members have been responsible for multiple fires in the Steens Mountain area” near Burns for more than 20 years, defying federal authority. One fire was set to destroy evidence of deer poaching, government investigators allege. “Hammond family members have publicly expressed their displeasure with BLM about the land use management methods of the [agency],” the indictment said. “Because the BLM ‘takes too long’ to complete the required environmental studies before doing controlled rangeland burning, the Hammonds have opposed BLM management of the rangelands and have burned the rangelands on their own,” the charging document said. It also alleged the Hammonds had “ignited uncontrolled fires under cover of naturally occurring dry lightning storms which occur on the western slopes of the Steens Mountain in late summers.” The Hammonds had engaged in a 20-year conspiracy of defying government and there was “substantial evidence” of the defendants’ guilt, prosecutors said in court filings. Before the jury could complete its deliberation on four additional counts, the Hammonds agreed to accept 5-year minimum sentences to avoid the possibility of even longer sentences if additional convictions were returned. Federal prosecutors agreed to dismiss the remaining counts that the jury hadn’t agreed upon. After their 2012 trial, Assistant U.S. Attorney Frank R. Papagni Jr. told the Hammonds in court that he would be recommending 5-year sentences for both. When the sentencing judge later handed down lighter sentences, the U.S. Solicitor General appealed, and the 9th U.S. Circuit Court agreed those sentences were illegal and ordered resentencing in line with the 5-year minimums mandated by Congress for the crime.